We listened to Conquering Your Goliaths: A Parable of the Five Stones on Audible. The children really enjoyed listening. Ms. Virginia Bean's adventure was endearing, fun, and thought provoking. Author Kathryn Elizabeth Jones touched on several difficult topics in a precious and delicate way. ﻿Through 7 delightful chapters, you journey with Ms. Virginia Bean as she is given 5 smooth stones, like David in the Bible. With each stone, she learns what her personal Goliaths are and how to overcome them. The stones are surprisingly not what I would have thought. Nothing about this story seemed to go the way I thought it would. Description: David gathered 5 smooth stones to meet and defeat Goliath. What did these stones represent and how can you use them to conquer Goliaths in your own personal quests? Ms. Virginia Bean will show you how. Kathryn Elizabeth Jones is an avid reader and writer. She says, "My favorite tool is the pen. Though computer keys get the words down quicker and easier, I like to put pen to paper, smell the ink, see the words as they are developed and renewed by new phrases or thoughts." She blogs and interviews other authors at Idea Creations Blog. 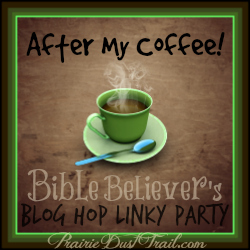 After My Coffee Link Up last week was wonderful! How can I pick a favorite?! Then a Fun post & a Helpful post. What a great variation! If you didn't catch these last week, make sure to visit.